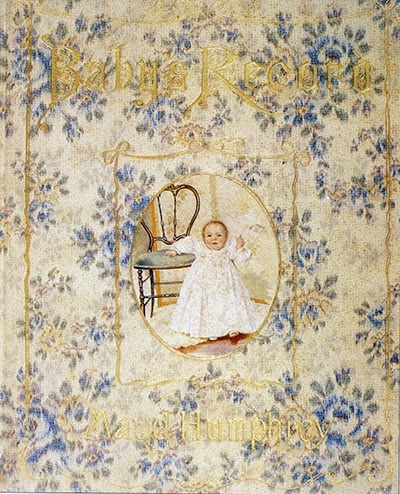 In 1898, Baby's Record was published by Frederick A. Stokes Co. of New York. 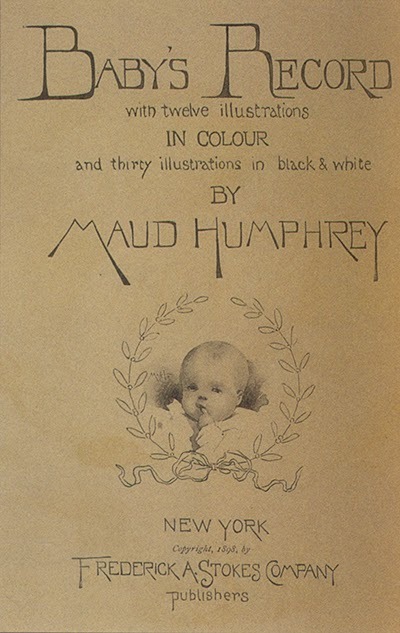 Issued in three simultaneous editions featuring one, six, or twelve color illustrations (all here), the book was by Maud Humphrey, who, in the same year, married Dr. Belmont De Forest Bogart. 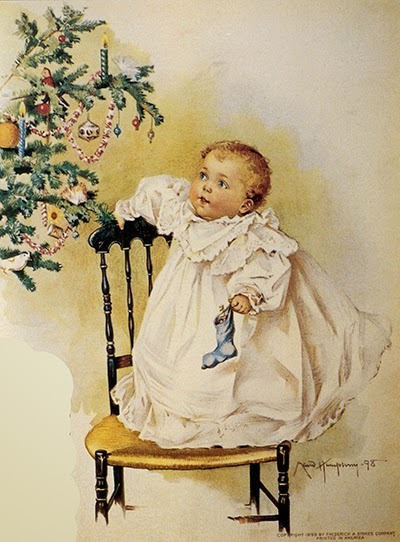 A year later, on Christmas Day, she bore a son. The couple named him Humphrey. 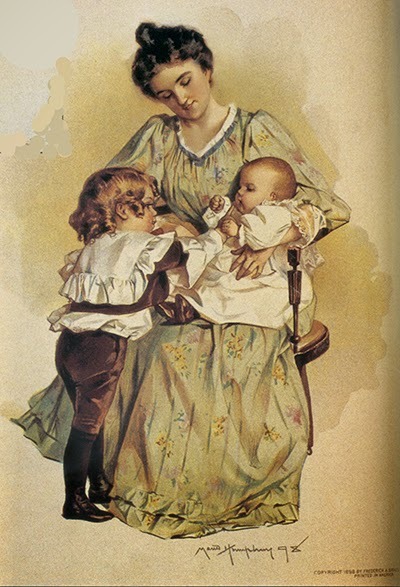 Maud Humphrey was born in 1868 to a well-to-do family in Rochester, New York. 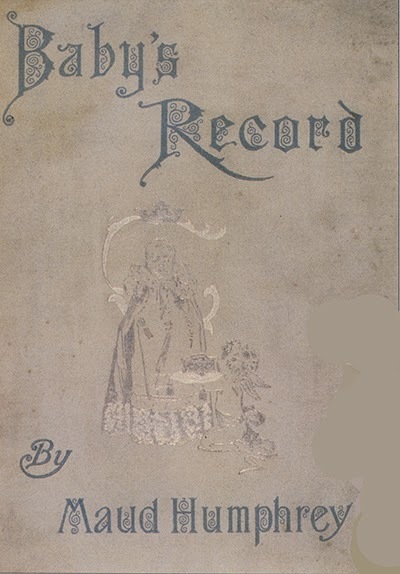 Demonstrating a precocious talent for drawing, by age twelve she was taking art classes and soon became one of the founding members of the Rochester Art Club. 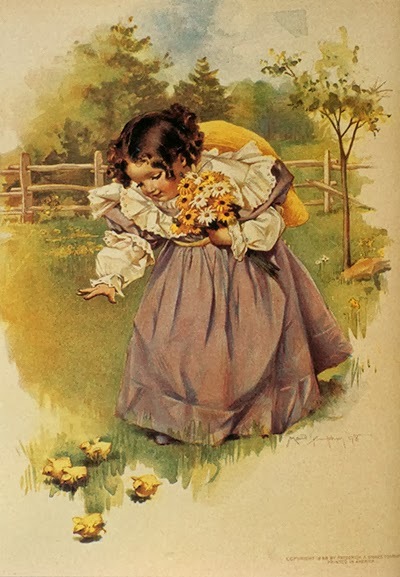 As a teenager she began to receive commissions to provide illustrations for children's magazines. At age eighteen she went to New York City and enrolled at the new Art Students League, later making the obligatory pilgrimage to Paris to continue her studies at the Julian Academy. 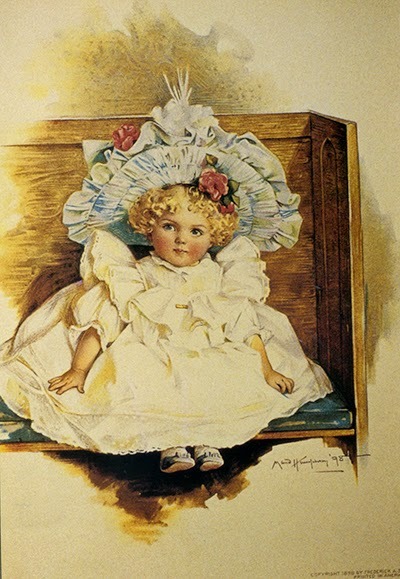 Returning to New York, her ambition and ability were rewarded by her era: it was the beginning of what is now known as the golden age of book illustration, which dawned in the mid-late 1890s with the development of improved printing techniques and color-printing processes, and set when World War I began. 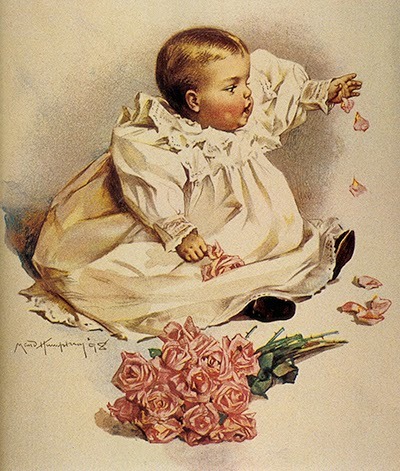 She became a highly in-demand illustrator for magazines, children's books, and advertising, her idealized and highly sentimental portraits of rosy-cheeked babies and youngsters very popular. 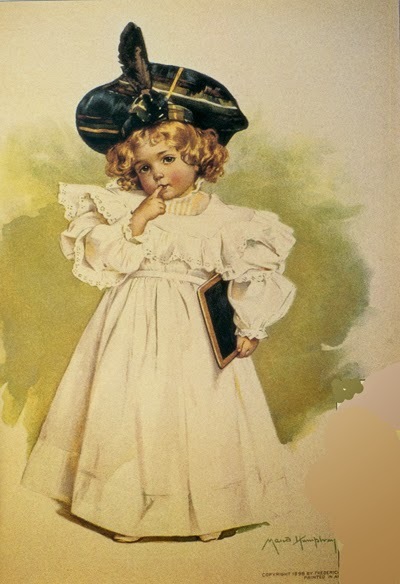 Ivory Soap was a client, as was Mellin's Baby Food. 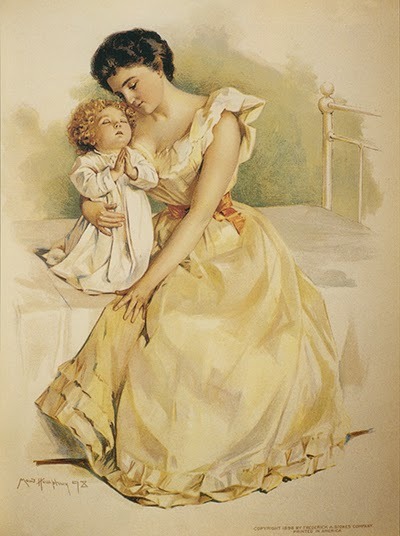 She preferred to use live subjects and master Humphrey clocked many hours as a babe posing for his mother's Mellin's Baby Food illustrations, often dressed-up in little girl's clothing. 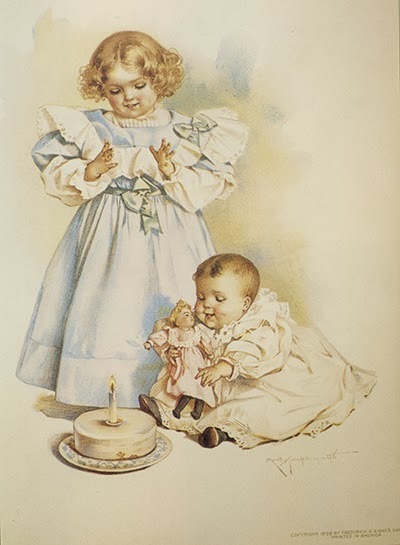 She ultimately became one of the most sought-after and highly paid female illustrators in the United States, her work reproduced for calendars and all manner of merchandise. 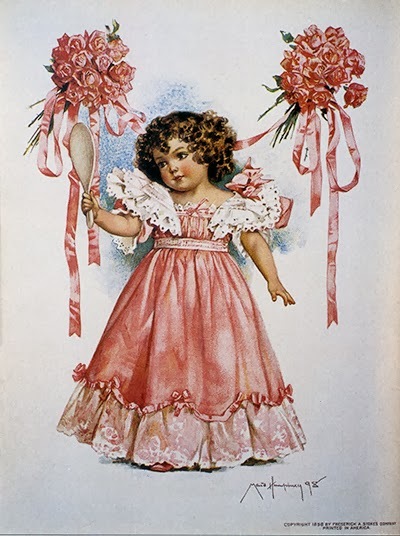 Other books illustrated by Maud Humphrey include Sunshine of Little Children (1888); Babes of the Nations (1889); Baby Sweethearts (1890); Bonnie Little People (1890); Ideals of Beauty (1891); Famous Rhymes from Mother Goose (1891); The Light Princess (1893); The Book of Pets (1893); Little Playmates (1894); Old Youngsters (1897); Little Grown-Ups (1897); The Littlest Ones (1898); Little Rosebuds (1898); Sleepy-Time Stories (1899); Gallant Little Patriots (1899); Children of the Revolution (1900); Little Continentals (1900); Little Folk of '76 (1900); Young American Speaker (c. 1900); and many more. 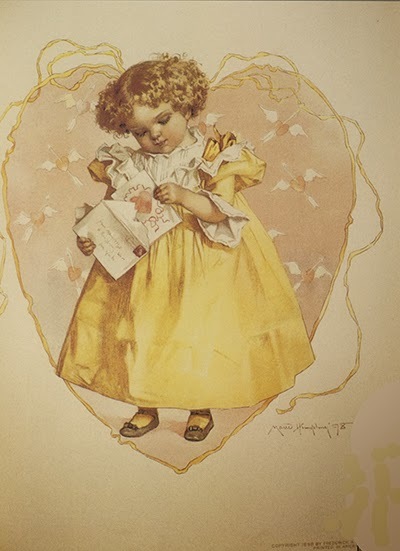 Maud Humphrey, along with Jessie Wilcox Smith, Bessie Pease Gutmann, Queen Holden, and Frances Brundage, was amongst the most sought-after illustrators of the late nineteenth through early twentieth century, her annual income often reaching upwards of $50,000. The average illustrator was earning approximately $4,000. 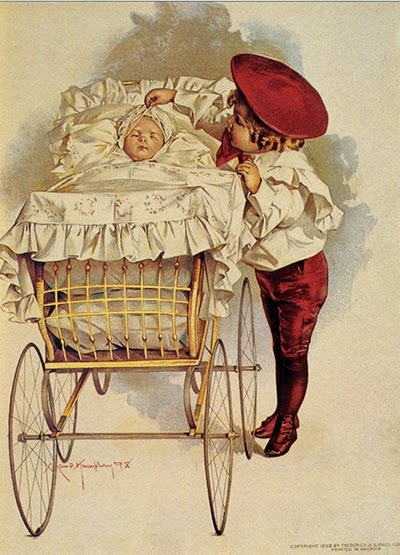 The combined income of the Bogarts allowed their son, Humphrey, to grow up in prosperity. The family lived in a large, posh apartment on New York City's Upper West Side, and retreated to an elegant "cottage" on their 55-acre estate on the shore of Canandaigua Lake in upstate New York. Draw it again, Mom. But, please, no more pinafores. 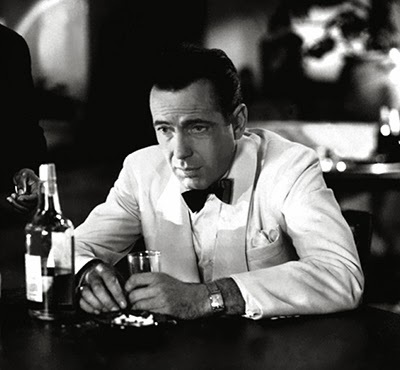 Of all the gin joints, in all the towns, in all the world, Maud Humphrey walks into mine, Café Booktryst, where the suspicious, the dubious, the imperiled, and the dispossessed read at the bar until the worst blows over. 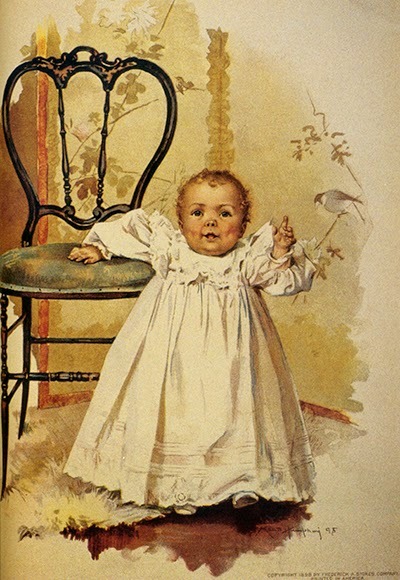 Brilliant Writing on Maud Humprey. Kudos. But don't Bogart this comment. Thanks for the write up and illustrations Stephen.Maud Humprey was inspirational.